If you would like to be notified when new paintings are listed or have any comments or questions send me an e-mail. Born in Santa Monica, California, Robert Frank was initially trained as an architect. He graduated from Rhode Island School of Design with a BFA. His love of drawing and painting, combined with architecture, lead him to a career as an architectural illustrator. His work has appeared in many books and publications including Architecture in Perspective, Architectureweek.com, Adobe.com, and “Views” published by the Rhode Island School of Design. 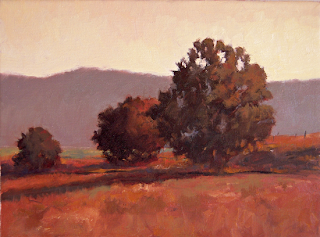 After seeing a show comprised of nationally recognized plein air painters in 2005 Robert became inspired to create oil paintings of the lush landscapes of Sonoma and Marin, California. He studied oil painting with Jason Bowen and took a workshop with Armand Cabrara. Robert’s work is influenced by many past and contemporary representational painters. He is now pursuing painting full time. He is a member and President Emeritus of the American Society of Architectural Illustrators and is also on the faculty at the Academy of Art University in San Franciso. His paintings and drawings are included in many private and corporate collections. Robert resides in Novato, California with his wife and two daughters.